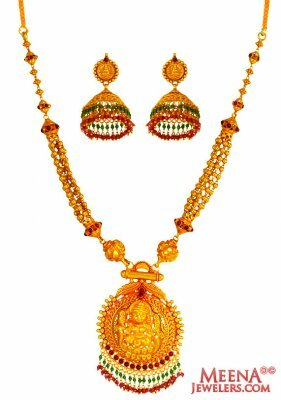 22 Kt Gold temple necklace set is brilliantly designed with embossed Laxmi Devi (Hindu Goddess) sitting on lotus flower. Entire set is designed in gerua finish with hanging colored beads. Earring type: Jhumki earrings are designed with embossed Laxmi Devi and hanging beads. Earrings have screw back post. Necklace is attached to a back chain and is adjustable. Hanging pendant 60.00 mm long and 42.65 mm width. Earrings is 40.00 mm long and 18.80 mm wide.